PARIS --- On January 14, 2019, French armed Forces Minister Florence Parly traveled to the Dassault Aviation facility at Merignac, near Bordeaux, to announce the award of the development and integration contract for the new F4 standard of Rafale. The Rafale F4 is primarily aimed at improving the Rafale's connectivity and associated networking modes, both in a national and a joint context. The Rafale F4 will be a first step for joint, networked cross-platform connected collaborative combat and therefore for the Future Air Combat System (SCAF). This new standard also provides for the integration of future developments of the ASMP-A medium-range nuclear missile, SCALP (or Apache) air-launched stand-off missile, and AASM (pronounced A2SM) 1,000 kg air-to-ground missiles. Finally, new developments will facilitate operational readiness and in-service support, with the introduction of fault diagnostic assistance, preventive maintenance and the modernization of the M88 engine’s computer. The decision to launch the F4 standard is part of the plans outlined in the 2019-2025 Military Planning Law which aims, in particular, to prepare France’s future defense. "The military programming law provides nearly 300 billion euros for the armed forces to allow the large-scale renewal of our equipment, including the complete modernization and renewal of our fighter aircraft. By 2024, 28 additional Rafale will be delivered and we will order 30 new ones in 2023," Florence Parly said in a speech also attended by Dassault employees. The F4 standard is the result of work carried out on a collaborative platform by the Directorate General of Armament (DGA), the armed forces staffs and the Aeronautical Maintenance Department (DMAé). 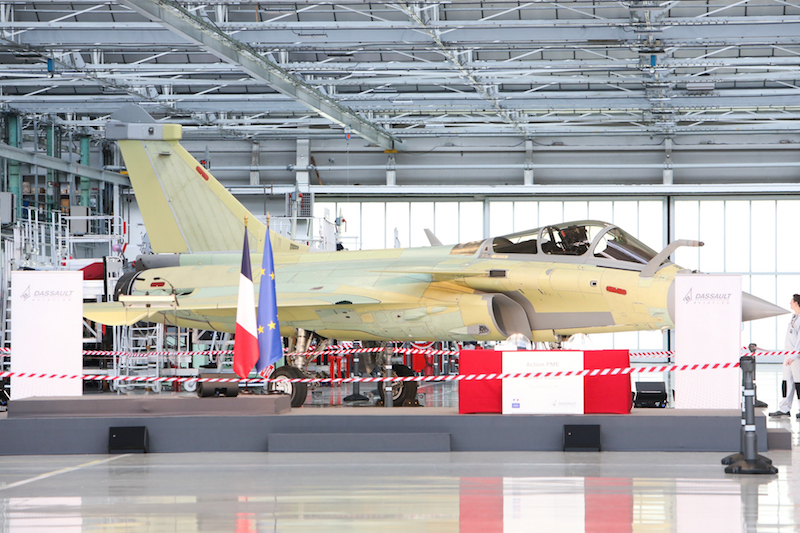 Launched less than a month after the qualification of the F3-R standard, this new standard is part of Rafale’s development process, allowing it to remain at the leading edge in the face of evolving national and export requirements. (EDITOR’S NOTE: In her speech, Parly mentioned additional features of the F4 standard: it will be equipped with satellite communications and a software-defined radio; it will also operate the modernized MICA air-to-air missiles; the SPECTRA self-protection suite will feature more powerful jammers “which will maintain our advance over our competitors”; the reliability of the M-88 engine’s computer will be improved ten-fold. Regarding deliveries, some of the Rafales to be delivered in 2022-2025 will be delivered to the F4 standard, as will the 30 Rafales which are to be ordered in 2023. Aircraft in previous equipment standards will be gradually upgraded to F4 standard.